The Trump administration has once again pointed to health insurers' robust stock market performance as proof that they are profiting from Obamacare. The White House's Council of Economic Advisers issued a report this week declaring that insurers have made a lot of money since the Affordable Care Act took effect, primarily thanks to large premium increases and generous federal funding of premium subsidies and Medicaid expansion. 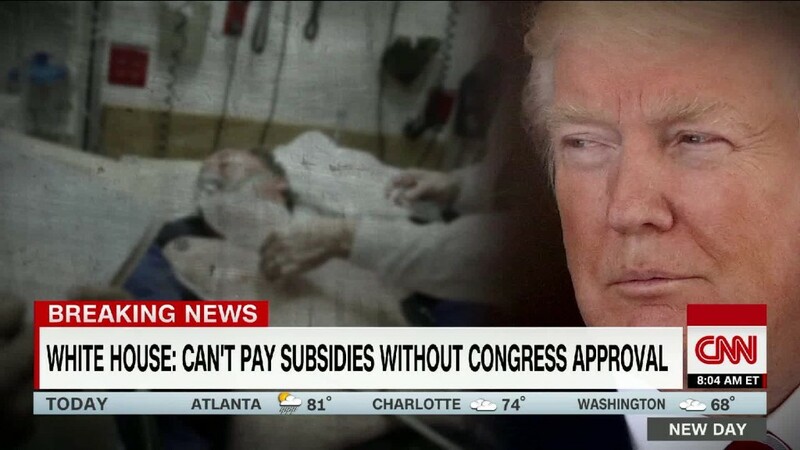 The release coincided with an unsuccessful attempt in the Senate to restore funding for a second set of Obamacare subsidies -- which helped to reduce low-income enrollees' deductibles and co pays -- that President Donald Trump eliminated last fall. "Despite an initial rough patch in the ACA marketplaces, the ACA Medicaid coverage expansion and subsidies to insurers have resulted in a large increase in health insurer profits," the four-page report said. The council's main argument: That the stock prices of health insurance companies rose by 272% since the health reform law's implementation in January 2014 -- more than double the gain of the S&P 500 over that period. While it's true that Obamacare insurers are finally becoming profitable, they aren't exactly rolling in the dough because of their involvement in the individual market, experts say. And carriers' stock prices are a poor measure of their performance on the exchanges given how many other factors contribute to their bottom line. In the first few years of Obamacare, many insurers priced their plans too low, resulting in big losses. This prompted many carriers -- including most of the large publicly traded ones -- to downsize or exit the market completely. There are just over 130 insurers on the exchanges this year, down from 237 two years earlier, according to data from the Centers for Medicare & Medicaid Services. Anthem (ANTM) is the only large public insurer with a sizable presence on the exchanges, but even it pulled out of several states for 2018. At least two years of big rate hikes have helped the insurers that remain get on more solid financial footing. Several recent studies, including ones by the Kaiser Family Foundation and S&P Global, have found that many insurers' premiums in 2017 were more than adequate to cover policyholders' medical expenses. Several insurers have reported their first profits in their Obamacare businesses. Highmark Health in Pittsburgh, Pennsylvania, announced earlier this week that its Affordable Care Act division generated income for the first time in 2017, calling it "a substantial turnaround." "The fact that it has taken so long to achieve some level of profitability speaks to the challenges that have long existed in the individual market," said Kristine Grow, a spokesperson for America's Health Insurance Plans, an industry trade association. Still, the individual market is not likely to be a font of big profits for insurers. It's expected to generate margins of only 1% or 2%, which is why many of the larger public carriers left, said Deep Banerjee, a director at S&P Global. The employer insurance market, on the other hand, generally produces profit margins of 8% to 10%. The Affordable Care Act also boosted enrollment in insurers' Medicaid divisions, which are generally profitable, experts said. States are increasingly contracting with insurers to manage the health care needs of their Medicaid enrollees, said Larry Levitt, a senior vice president at Kaiser. This includes the more than 11 million low-income adults who entered the program through Medicaid expansion. Nearly two-thirds of plans in states that expanded Medicaid said that it has had a positive effect on their financial performance, according to Kaiser's 2017 Survey of Medicaid Managed Care Plans. As for the insurers' stock prices -- that's usually driven more by their employer and Medicare divisions, which are typically much larger, as well as by carriers' efforts to control costs, Banerjee said.